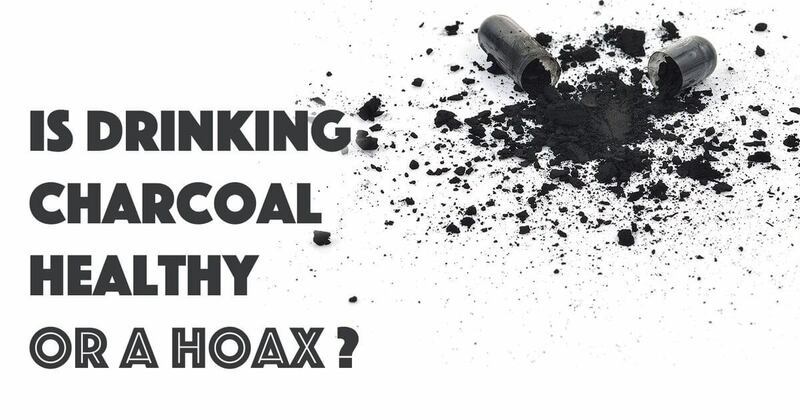 Is Drinking Charcoal Healthy or a Hoax? Home/Blogs/Is Drinking Charcoal Healthy or a Hoax? Activated charcoal has long been used in acute situations for pulling toxins out of the human body. Its composition is adsorbing, which means that it pulls other substances into itself and carries them out of the body. The process of creating activated charcoal is done chemically by heating charcoal made from wood, coal, coconut or peat until it develops sponge-like pores. What are these medicinal properties? If you suffer from gas or bloating, activated charcoal can help by trapping the gas. It can remove stains and plaque from your teeth if you brush with it occasionally. It can be used as a purifying mask your on your skin or a clarifying agent in your shampoo. Because it’s so porous it can be used to trap 50-60% of unwanted contaminants in your stomach and intestines and has been used in medical emergencies for people who have ingested a toxic substance. Others also believe it can help with food poisoning or alcohol poisoning as well. Nowadays, adding activated charcoal to detox beverages and cosmetic products is gaining in popularity. Many juice companies offer “charcoal lemonade,” which is a mix of water, lemon juice, sweetener and activated charcoal. The taste of the inky beverage is often described as not too different from regular lemonade (though some people say it reminds them of cement), and the texture is typically described as a bit chalky. As far as whether there are any benefits of drinking charcoal, the answer is a soft “yes,” with a couple of major caveats. First, the actual quantity of activated charcoal in a prepared charcoal beverage can be pretty minimal. Find out if the $10 drink you’re considering actually contains much charcoal; otherwise you’re just buying some very expensive lemon water. Next, it’s important to understand that when to take activated charcoal is incredibly important. Juice brands generally fail to mention that charcoal binds to everything in your system! Not only will charcoal help pull out any toxins floating around, it will also render medication taken in recent hours inert and prevent you from absorbing the nutrients in your food if taken within several hours of eating. All too often, companies make no mention of this on the label. Additionally, it’s also sold as an addition to green juice in bottles; this means that all those good vitamins and minerals from the green juice will never have the opportunity to enter your system, since the charcoal will prevent that. The best time to drink charcoal is either at the start of the day if you won’t be having breakfast for several hours, or before bedtime, with dinner eaten several hours prior. Juice makers claim that activated charcoal can flatten stomachs and improve energy levels, and those claims do have some merit: By reducing intestinal gas, your stomach will be flatter after drinking it — if your lack of a flat stomach was caused by gas and not fat. If your low energy levels are because of toxins in your system, charcoal will improve your energy level by removing them. But if you think you might want to try an activated charcoal drink, you have more options than paying $10 for one at a juice bar. An entire bottle of 100 activated charcoal capsules made from coconut, which is generally considered in wellness circles to be the healthiest option, costs less than $20. If you’re less picky about sourcing, activated charcoal made by brands such as Nature’s Way cost less than $10 for 100 pills. To match what the average juicery adds to a bottle of charcoal lemonade, you’d probably want to add two to four capsules. If you decide to buy your own charcoal, there are other uses for it as well: It’s a safe alternative for teeth whitening and is often used in place of a whitening toothpaste. Warning: This is a pretty messy task to take on! If you do try it, you’ll need towels on hand to clean up your bathroom sink afterward. Activated charcoal can also be added to face masks, which can be helpful for acne brought on by environmental toxins. Outside of using it incorrectly by taking it close to medications or food, activated charcoal is generally considered harmless. As for whether it will actually boost your mood, it’s worth a try if you’re curious — it just might. At the very least, you’ll look pretty hip sipping on it. Charcoal has been used in medicine since the ancient Egyptians used it to absorb the odor of rotting wounds, Drugs.com states. Useful for its ability to absorb impurities, charcoal plays an important role in filtering drinking water and treating acute poisoning. Activated charcoal, also known as medicinal charcoal, is a fluffy, fine, black, odorless, tasteless powder without gritty material. In an emergency, activated charcoal can be used to treat certain kinds of poisoning, according to MayoClinic.com. Being extremely absorbent, activated charcoal helps prevent the poison from being absorbed from the stomach and passed into the body. In the case of severe poisoning, several doses of activated charcoal may be needed to treat the victim. Activated charcoal is not effective against poisons that are corrosive agents like lye, strong acids, iron, boric acid, lithium and alcohols. Furthermore, charcoal should not be used to counteract petroleum products such as leaning fluid, coal oil, fuel oil, gasoline, kerosene and paint thinner because charcoal will not prevent these substances from being absorbed into the body. Common side effects of activated charcoal include nausea, vomiting and constipation, Drugs.com states. Other side effects include bowel obstruction, black-colored stool and a chalk-like taste have also been reported. About 20 percent of patients experience vomiting about 10 minutes after ingesting activated charcoal. One case reports that a patient developed a bezoar or mass in his small bowel that caused an obstruction following the administration of 30 to 60 g of activated charcoal via nasogastric tube every four to six hours for five days. Activated charcoal is used only for treating some cases of poisoning. Proper doses vary from patient to patient and you must not change your dosage unless your doctor tells you to do so. The powder form of activated charcoal is taken as a mixture of the powder and water with the amount of powder dependent on the age of the patient. For adults and teenagers, a single dose treatment is usually 25 to 100 g, MayoClinic,com states. For children from 1 to 12 years old, the dose is usually 25 to 50 g or the dose may be based on body weight, typically 0.5 to 1 g per kg. For children up to one year old, the dose is usually 10 to 26 g.
Activated charcoal is made from wood or vegetable matter that is oxidized at extremely high temperatures and then treated with various substances such as carbon dioxide, oxygen, air, steam, sulfuric acid, zinc chloride, or phosphoric acid or a combination of these to increase the adsorptive properties of the charcoal, Drugs.com states. These materials serve to remove impurities and reduce the particle size of carbon, thereby increasing the surface area and consequently, allowing for more absorption. One ml of medicinal charcoal that has been subdivided and activated has a total surface area of approximately 1,000 sq. m.